The new year might have just begun, but our minds are still firmly in the past. No, we’re not talking about what we’ve been up to in 2018! Instead, we plan on going even further down the rabbit hole and using the start of 2019 as an opportunity to learn about our pasts, namely our ancestry. Here’s the thing: We’re big proponents in using the past to guide our future. Plus, learning more about our history will help us make more educated decisions in the present! The road to self-discovery starts with learning about what makes each of us so unique and special: Our DNA. Learning about what makes us, well, us, is one of our top resolutions in 2019, so might as well get started now — especially while there’s a good sale! See it: Snag the 23andMe Ancestry Kit for just $99, or pick up the Health + Ancestry Kit for $199 at 23andMe! Plus, get 10% off each additional Health + Ancestry Kit. Discount available upon checkout. Limited time only! One of the best ways to do just that is a DNA testing kit. That’s right: We’re talking about 23andMe! We’ve all seen the magic it can do for those looking to understand their history. Haven’t gotten a chance to learn more about the kit? Let us give the walkthrough! 23andMe is a great way to learn about our DNA and health (though we’ll get to the latter later). For starters, we can pick up an Ancestry service, which is designed to help us learn all about our DNA story! The kit breaks up our DNA into more than a thousand regions worldwide, plus traces our roots back to ancestors that have lived more than 500 years ago. There’s more. The kit tracks our ancestry percentages down to the 0.1%, plus it gives us the opportunity to explore results with different confidence levels. We can also map our ancestry based on our maternal and paternal lineage. 23andMe does just that by tracing haplogroups to a specific set of individuals a long time ago. Heads up: Women can only do their maternal haplogroup (our mother’s mother’s mother’s mother and so forth) because paternal haplogroups are found in the Y chromosome, which women do not inherit. Want to explain some of the more inexplicable traits? Back hair and height, for example, are associated with specific Neanderthal DNA. Though Neanderthals disappeared about 40,000 years ago, 23andMe can tell us how much of our DNA is derived from our distant relatives. Cool, right? If you’re anything like us and want an even more immersive report, we got you covered! 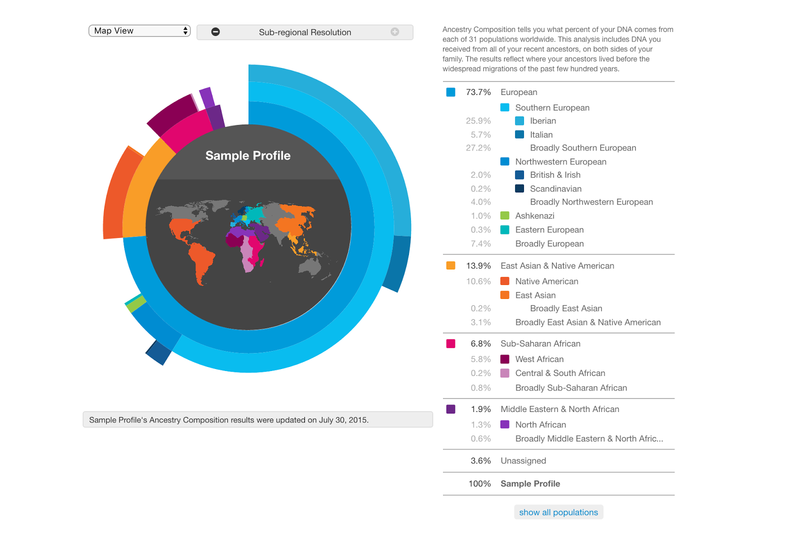 23andMe also offers a Health + Ancestry service that goes even further. The service offers all the perks of the Ancestry kit, plus some serious health bonuses. First, it comes with additional reports for wellness, genetic health risks, carrier status and traits. The wellness reports help teach how genes impact wellbeing and lifestyle choices, including lactose intolerance, deep sleep and even genetic weight. The carrier status report (which means the requirements set forth by the FDA) includes over 40 reports for some inherited conditions, including cystic fibrosis, sickle cell anemia and hereditary hearing loss. The report for traits includes over 25 reports on how our DNA influences characteristics including smell, taste and facial features. Worried about hair loss? Wondering about a unibrow? All those are included in your reports. Sure, that all sounds awesome, but how factual is it? Good (and valid) question! 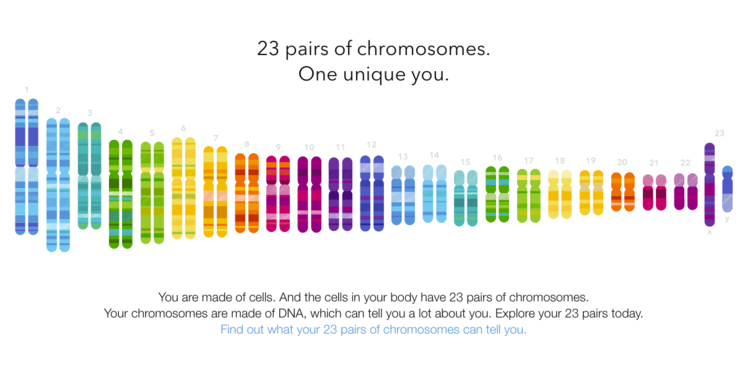 23andMe sets rigorous standards on both staying factual and private. The Genetic Health Risk and Carrier status reports — both included in the Ancestry + Health report — meet FDA criteria for scientific and clinical validity. The DNA collection kit is also FDA-cleared, plus it’s manufactured to meet the FDA Good Manufacturing practice regulations. They’re also accurate: As we noted before, 23andMe ancestry estimates are derived down to the 0.1 percent. Beyond that, 23andMe ensures the privacy of each customer by allowing us to be in control of just how much we share. For example, we can choose to opt out of other 23andMe members seeing our account, as well as whether our saliva sample is stored or not. Additionally, the brand employs software, hardware and physical security to ensure that the computers that store our information are protected. Personal information and genetic data are also stored separately. There’s no need to make an appointment with a doctor or do a finger prick for a blood sample! It’s a totally non-invasive process — all we have to do is collect our saliva in a tube that comes with the kit. There are step-by-step instructions too, so it’s super easy.